When recently divorced Oscar invites getting-divorced Felix to share his New York apartment, it might not improve their friendship. In fact, it might just ruin it. Will Felix survive late nights, television dinners and yesterday’s towels? And will Oscar survive drink coasters, clean ashtrays and the recipe for London broil? And who threw that spaghetti at the wall? 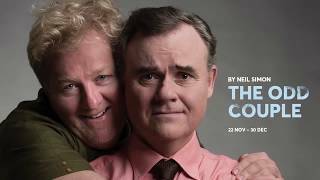 Comedy masters Darren Gilshenan and Steve Rodgers are the definitive odd couple in Neil Simon’s Tony Award winning comedy of divorce, friendship and (mis)understandings.